On Saturday, April 7, 2018, at 6:00 pm, a Mass will be celebrated at St. Faustina Church in Warren (14025 E. Twelve Mile Road, Warren, MI 48088) to commemorate the eighth anniversary of the Smoleñsk Polish Aircraft victims. The Mass, organized by the Michigan Division of the Polish American Congress (PAC-MI), will also pay tribute to Katyñ Massacre victims. Fr. Bogdan Mi³osz, the pastor of St. Faustina Parish, will celebrate the Mass. The 2010 Polish Air Force Tu-154 crash occurred on April 10, 2010, when aircraft crashed near the city of Smoleñsk, Russia, killing all 96 people onboard. These included Polish President Lech Kaczyñski, and his wife, former President in-Exile Ryszard Kaczorowski and other officials and members of Polish clergy. The flight was heading to Katyñ taking many high ranking Polish officials to ceremonies marking the 70th anniversary of the Katyñ Massacre. The Katyñ Massacre was a series of mass executions of Polish nationals carried out by the People’s Commissariat for Internal Affairs (NKVD), the Soviet secret police, in April and May of 1940. 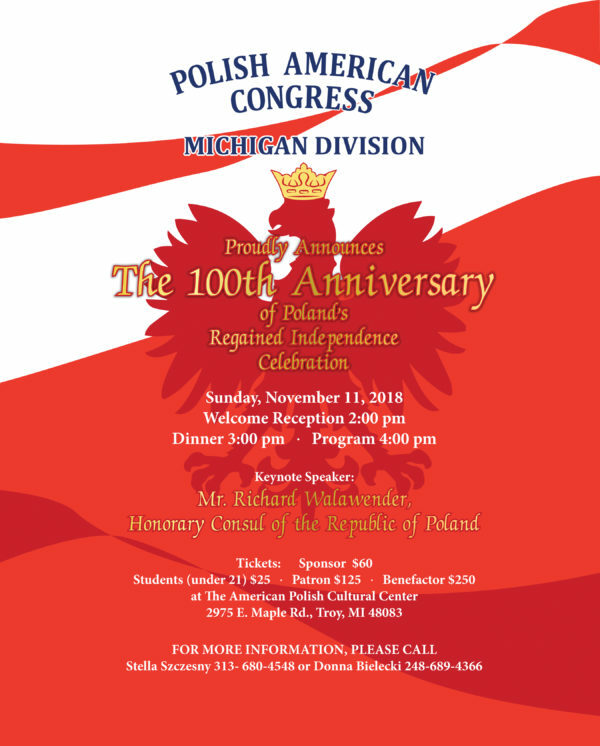 The Polish American Congress, Michigan Division, is a local division of the Polish American Congress, which is a national umbrella organization of Polish-Americans and Polish-American organizations. Its membership is composed of fraternal, educations, veteran, religious, cultural, social, business and political organizations, as well as individuals. The PAC promotes civic, educational and cultural programs designed to further not only the knowledge of Polish history, language and culture, but to stimulate Polish American involvement and accomplishments. We invite you to join us for the Polish Day Parade, Monday, September 4 (Labor Day) in downtown Hamtramck. The parade begins at 1:30 pm. Marchers gather at the corner of Holbrook and Joseph Campau and proceed north on Joseph Campau to Commor. It is considered one of the largest ethnic parades in the state of Michigan with many individuals and groups participating, including political figures. The parade is organized Polish Day Parade Committee of the Polish American Congress Michigan Division. A long, rich history is associated with the founding of the Polish Day Parade. In the 1930s, the roots of the present day Polish Day Parade took hold with the May 3 Polish Constitution Day observances held on Detroit’s Belle Isle. The Polish Day Parade evolved into the Pulaski Day Parade and was held in the fall of each year in downtown Detroit. This year the Parade will celebrate two extraordinary Poles who risked their lives under the banner of freedom, both in Poland and America, Thaddeus Kosciuszko and Kazimierz Pulaski. A special float celebrating these figures is being prepared by the Parade Committee. 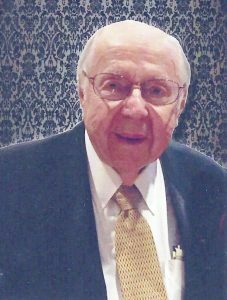 The Grand Marshal of this year’s Parade is Mr. Ray Okonski (pictured), a well-known and respected philanthropist, active supporter of Polonia for many years, especially in the area of scholarship programs. Come and celebrate your Polish Heritage by participating in the 2017 Polish Day Parade! 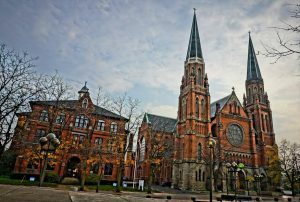 St. Anne De Detroit Church, located near Ambassador’s Bridge in Detroit, dates back to Cadillac’s settling of Detroit in 1701, and it’s considered the second-oldest continuously operating Roman Catholic parish in the U.S. The current Neo-Gothic structure, the parish’s 8th church building, dates to 1886 and is listed on the National Register of Historic Places. On Thursday, July 20, a Polish Novena will be held, with Fr. Ostrowski as Presider, and featuring award-winning Filarets Choir. Knights of Columbus, Polish dance groups will also be featured. This year the Novena will introduce a special new tradition: carrying of flags – the flag of the nation represented, the Detroit flag, the American flag, and the Vatican flag. On Wednesday, August 9, 2017, the Polish American Congress of Michigan (PACMI) Scholarship Fund will host its annual Fund Raiser / Dinner, during which 2017 PACMI Scholarship Recipients will be presented. The event will take place at Krakus Restaurant in Detroit (12900 Joseph Campau). Doors open at 5:30 pm; dinner served at 6:00 pm. Suggested contributions: $30.00 per person (contributions in excess of $20.00 are tax deductible). For a contribution of $250.00 or more towards the Scholarship Fund, each donor will receive a document of their contribution. Reservations can be made by August 2, by calling 313-365-9400 or 586-751-8168. This year, the Polish American Congress of Michigan Scholarship Fund selected nine students which will be presented with scholarships. They are: Danielle Miller (Oakland Univeristy; major: Health Science), Ewa Sztandera (University of Detroit Mercy; major: Nursing), Hanna Gove (Grand Valley State; major: Occupational Therapy), Agnieszka Miklasewicz (Western Michigan University; major: Law), Pamela Jablonski (University of Michigan; major: Business Admnistration), Natalia Jablonski (University of Michigan; major: Nursing), Karina Cieslak (Wayne State University; major: Bio-Chemistry), Evelina Kutyma (Unviersity of Michigan; major: Public Health). 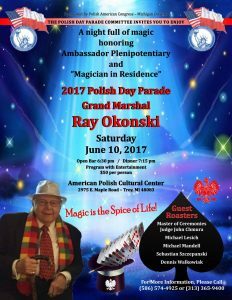 We invite you to join fun crowd at the new and improved Pierogi Palooza II event , Friday, June 2, 2017, at the PNA Council 122 Hall, 10211 Conant in Hamtramck, MI 48212 (guarded parking). Good food (including many varieties of pierogi to try) and your favorite beverages (all for very reasonable prices), lively entertainment, Polish merchandise for purchase, raffles, Polish heritage displays, and a true Polish American experience are all guaranteed from 4:00 pm to midnight. $2.00 gets you in with food and beverage options to purchase. 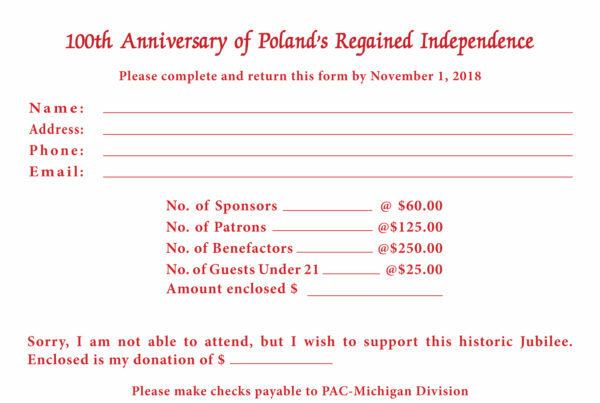 This is a FUNDRAISER for Polish American Congress Michigan, which is the umbrella organization of Polonia serving the Polish American community for over 70 years. We were happy to host so many of you at last year’s successful event and hope to see you back this year. Everyone is Welcome! Come Hungry and Bring your Dancing Shoes! Feel free to share it with your family, friends, neighbors, and co-workers. See you on June 2! POLISH DAY PARADE ROAST – Come and support Polish Day Parade! For more information, please call 313-365-9400. A special appeal to Polonia – “Invest in the Future” Make a Difference Scholarship Appeal – was recently made by the PAC-MI Scholarship Fund. A letter asking for monetary support of the Scholarship Fund was recently sent out to all PAC-MI members and friends. “The Polish American Congress of Michigan Scholarship Fund, Inc. has limited income to use for this year’s Scholarship Recipients. Since our major fundraiser to be held in August, at the Krakus Restaurant will not be sufficient to award each recipient at least $1,000.00 in scholarships, we now need additional funds,” reads the letter. PLEASE, SUPPORT THE SCHOLARSHIP FUND! Checks are to be made payable to: PAC of Michigan Scholarship Fund, Inc.